Adapting to a new language and a new culture is a difficult experience, but the troubles of translation can lead to hilarious miscommunication. That was certainly the case for Dr. Ron Deigh. Deigh spent seven years living in Germany with the United States Army Veterinary Corps. While overseas, he tried to immerse himself in the German culture, often with comical results. 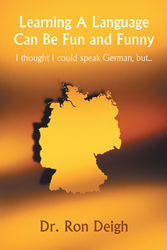 His new book, “Learning a Language Can Be Fun and Funny,” mixes his humorous experiences with his genuine affection for the German people. Deigh hopes his book will encourage readers to learn new languages and experience other cultures around the world. For more information, visit http://www.drrondeigh.com/. Dr. Ron Deigh, now a retired community college professor of biology, previously served as a lieutenant colonel in the United States Army Veterinary Corps. He enjoyed seven full years traveling with the U. S. Army throughout Germany and the rest of Europe, learning the German language and learning how truly wonderful and hospitable the Europeans are. He and his wife currently reside in Visalia, Calif.